Who’s Not Going Back to School? As this summer draws to a close, children, parents, and teachers across the country have begun the annual ritual of returning to school. Stores are advertising sales on school supplies, and schools have reopened so that teachers can begin decorating classrooms and readying their lesson plans. Bright yellow school buses are once again a mainstay of the morning commute. Many children across the country are beginning a new school year, as their parents wave goodbye and send them off to new learning experiences. Unfortunately, in many communities across the country, some children won’t be showing up for school this year. Classrooms will shut down and teachers will look for other employment opportunities. This school year approximately 57,000 of our youngest children in the Head Start program won’t be going back to school. These cuts are the result of sequestration. In March 2013 a sequester order canceled $85 billion in federal funds, which included a $405 million cut to the Head Start program. Looking ahead, another sequester is possible in the next fiscal year if Congress cannot agree on how to meet established spending caps. The Head Start program, established in the 1960s as part of then-President Lyndon B. Johnson’s War on Poverty, provides comprehensive preschool services, along with medical, dental, and mental-health screenings and follow-up services, nutritional services, and social services for families. Head Start reaches nearly 1 million children across the country, the vast majority of whom are from families with incomes at or below the federal poverty level. In 2012 Head Start had a budget of almost $8 billion. In 1994 the Early Head Start program began serving pregnant women and children from ages 0–3; it now reaches more than 100,000 infants and toddlers. While long lines at the airport and canceled White House tours have made national headlines, cuts to early childhood programs have been less visible. Media outlets have reported grim consequences, including a lottery in an Indiana Head Start program to determine which children were cut and program closures in Kansas and New York. When programs close their doors, children who attended them lose out on access to high-quality early learning opportunities, families aren’t able to work without access to child care, and staff are left looking for jobs. Cuts to early childhood programs are particularly problematic because we know that early childhood education is a sound long-term investment that pays for itself and prepares our nation’s future workforce for success. Instead of discussing how to absorb cuts, the conversation should focus on how to expand early childhood education to more children, as President Barack Obama proposed in his FY 2014 budget. Sequestration’s impact on Head Start directly harms economic recovery by eliminating jobs and services to children and families that help them move into the middle class. President Obama proposed an initiative that would provide $75 billion over the next 10 years to enroll all 4-year-olds in the United States whose households earn up to 200 percent of the federal poverty level in high-quality preschool programs. The proposal would build on the 40 state-funded preschool programs already in existence by providing federal dollars, matched by the states, to expand access to high-quality programs. Quality standards would include early learning standards, comprehensive data and assessment systems, teachers with bachelor of arts degrees and compensation comparable to K-12 teachers, low child-to-teacher ratios, and comprehensive services for children and families. The proposal also includes $1.4 billion to expand Early Head Start through partnerships with child care and $15 billion over the next 10 years for the home-visiting program. As Head Start programs struggle to cut their budgets after the March sequester, the loss of children’s access to programs is an inevitable consequence. Families of the 57,000 children who completely lost access to Head Start will struggle to find alternate options, and most will likely lose access to high-quality early learning. In some communities—such as Neodesha, Kansas, where the Head Start program has to close down—Head Start is the only center-based program available to families. Families that live in states with robust preschool programs might be able to enroll their 4-year-olds, but nationally, only about one-fourth of children are enrolled in state-funded preschool programs, and only eight states serve more than half of their 4-year-olds in preschool. Three-year-olds are even less likely to find access to publicly funded programs, as only 4 percent of them are served nationwide. Low-income families that are unable to find state-funded preschool programs will be hard pressed to find other options. In the private child care market, the average annual cost of center-based care for a 4-year-old ranges from $4,000 per year in Mississippi to $12,000 per year in Massachusetts. Of the children cut from Head Start, about 6,000 are infants and toddlers in the Early Head Start programs. These children are the least likely to find access to another program, as few states fund center-based programs for children under age 2. The average cost of center-based child care for an infant ranges from $5,000 per year in Mississippi to $15,000 per year in Massachusetts. Most children in Early Head Start come from poor families who cannot afford such high tuition rates. Many of these children will likely end up in unregulated or poor-quality care so that their parents can continue to work. Even among programs that are not cutting enrollment, many are cutting back on program hours. According to the Department of Health and Human Services, or HHS, more than 1.3 million school days have been cut from Head Start nationwide because programs either ended early last school year or delayed the start of the school year this fall. Programs also shortened the school day by cutting 18,000 hours nationwide. Cutting children from early learning programs and reducing the school day or school year will backfire as a long-term strategy. Research shows that high-quality early learning programs pay off in the long term, providing a return on investment of $7 for every $1 invested. Moreover, the amount of time spent in class in early childhood does seem to matter, and children who attend full-day extended-year programs do better on measures of math and literacy than children who attend shorter programs. At the end of the Head Start program, children who attend the program show improvements across a range of cognitive domains and literacy skills, compared to their peers who do not attend. In addition, Head Start children show reduced rates of behavioral problems and hyperactivity. Over the long term, children in the Head Start program have a reduced need for special education and grade retention as well as higher rates of high school graduation. 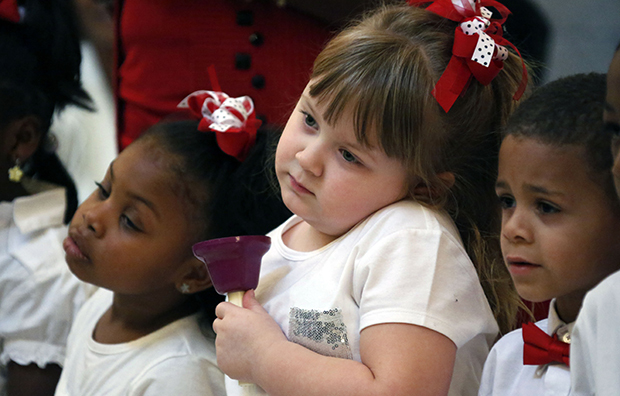 In order to reap the benefits of early childhood education, we need to spend more, not less. 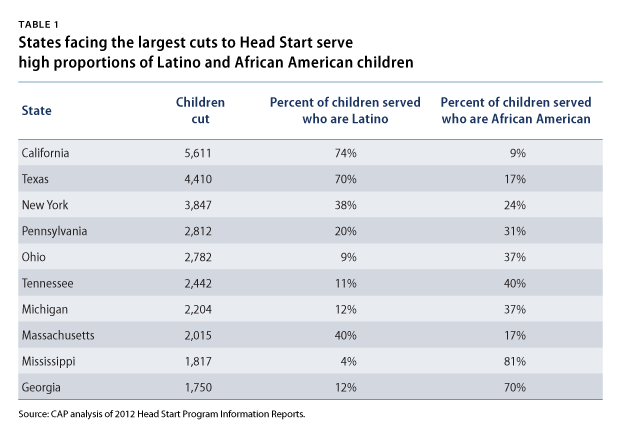 Prior to sequestration, Head Start served only half of all eligible children. As mentioned above, state-funded preschool serves only a fraction of 3- and 4-year-olds. The long-term benefits of early childhood education—including improved academic performance, reduced need for special education and grade retention, higher high school graduation rates, and higher wages—necessitate greater investments. While most countries—including the United Kingdom, Mexico, and China—have pledged larger investments in early childhood education, the United States is scaling back its programs. If the United States is to remain competitive in the global market, we must follow suit and ramp up our investments in our young children. HHS has come under fire lately because a recent study found that these benefits are not detectable when children reach the third grade. Researchers have debated some of the methodological issues in the study, but it is clear that children do make gains during the Head Start year and enter kindergarten better off than if they had not attended Head Start. The program also made some important reforms by requiring the lowest-performing programs to compete for funding with other early childhood education providers in the community. Head Start helps prepare children for success in school; reducing access to it means that poor children are less likely to enter school ready for kindergarten. Since its launch in 1965, Head Start’s approach to early childhood education has been comprehensive, taking all of children’s needs into account to ensure that they are not just academically ready for school but also physically, mentally, and emotionally ready. In addition to providing children with access to preschool, the Head Start program delivers medical, dental, nutritional, and mental-health services, as well as referrals to social services for families. Many programs also provide transportation to ensure that children have access to the program, even if their families do not have access to a vehicle or have work schedules that preclude dropping them off and picking them up. As programs absorb sequester cuts, they must continue to provide children and families with the comprehensive services required by law. The full impact of sequestration on social services for families is not yet clear. While these services are program requirements that must be maintained even at reduced funding levels, the quality of these services will likely suffer. Higher caseloads for family social workers, for example, could lead to slower response rates and follow-up services. At least one program in Northern Virginia reported that it laid off staffers who were responsible for providing social services to families. Approximately 20 percent of programs are cutting back on or eliminating transportation services, as this is an optional service that is not required by law. For low-income families that might not have reliable access to a car, cutting back on transportation is akin to cutting access to preschool. Many low-income families that qualify for Head Start work jobs that require irregular hours and do not have flexible schedules that would allow them to drop off and pick up their children from school. This problem is particularly pronounced in rural areas and other areas with limited public transportation options. In Palm Beach County, Florida, for example, the Head Start program canceled transportation services for 2,300 children and eliminated 14 jobs. The Washington Post reported that programs in Northern Virginia will also cut back on transportation services, and the program director worries that some children will no longer be able to participate. Reductions in services will limit access for the neediest children and compromise the effectiveness of early childhood programs. Comprehensive services ensure that children receive services for special needs, medical and dental treatment, and nutritious meals. They also help families access services available to them to secure stable housing and other basic needs. The president’s Preschool for All program includes comprehensive services as part of preschool education. Expanding preschool with comprehensive services provides a multipronged approach to poverty reduction for children and their families. Such an approach is needed to reduce poverty and prepare children for success in school. For many families, early childhood programs not only prepare their children for school but also provide much-needed child care that allows parents to work. In Head Start nearly 40 percent of families included two working parents or a single working parent in 2012. As Head Start programs cut days from the program year and shorten the length of the school day, working parents with few options are left to find alternate child care arrangements. The cost of child care is often prohibitive. As mentioned above, the cost of child care in the private market typically exceeds what low-income families can pay. In most states the average cost of two children in center-based care exceeds average housing costs. Child care subsidies are available for some families, but only about a quarter of eligible families are able to receive a subsidy due to high demand and limited funding. Many states have long waiting lists for subsidies, and states are eliminating an estimated 30,000 child care slots this year due to sequestration. I am a working mom so it puts a strain on me finding somewhere for him to go during the time he would usually be in school. I can trust the school, [but] not so much everyone else. I think he should be in a positive environment as much as possible. … It cuts down tremendously on the learning time he is getting every week. Other parents are left without child care completely when they lose access to Head Start. A Bloomberg report on sequestration highlighted the experience of Kelly Burford, a parent in Taneytown, Maryland, whose son, Bradyn, lost access to the Head Start program. She worked as a department store clerk earning $7.25 per hour. After losing access to Head Start, she quit her job to care for her son. In Maryland center-based child care for a preschooler costs more than $9,000 per year, which would have nearly consumed her salary. Many parents will find themselves unable to afford to work in the absence of the Head Start program. Given the lack of affordable high-quality child care options, some will be faced with the untenable choice of using substandard child care or quitting their jobs. Cuts to early childhood programs are not a viable solution to reduce unemployment. Any plan that gets people back to work must include an investment in child care and early childhood education programs to meet the needs of working families. In a report from earlier this year, the Center for American Progress proposed preschool for all 3- and 4-year-olds and a large expansion of child care, doubling the number of infants and toddlers served and increasing the subsidy rate. The Obama administration’s plan would take some important steps toward this goal by serving all low-income 4-year-olds and doubling access to Early Head Start through partnerships with child care programs. According to HHS, approximately 18,000 Head Start staff members have experienced job loss or salary cuts as a result of sequestration. These cuts disproportionately impact low-income women, who comprise the majority of the early childhood workforce. In Head Start about half of the staff who work directly with children are people of color. The average salary for a Head Start teacher is $28,000 per year, while an assistant teacher makes an average of $18,000 per year. Many of these women live in poverty or just above the poverty line and cannot afford any reduction in pay or benefits. Cuts to early childhood education and the potential for further cuts in the future lead to job insecurity and could further exacerbate retention problems in the early childhood field. Early childhood education has notoriously high turnover due to low wages and a lack of professional development and advancement. In 2012, 14 percent of Head Start teachers left their jobs. There is a lot of uncertainty for me and my new team because we know that sequestration cuts may have just begun. I want to be an effective teacher. I want to make a difference. I know that security is important for children but it is important for me, my family, and my teammates too. Sequestration equals fear. Fear of the unknown, fear of more cuts; fear that my position will not even exist next year. A large-scale investment in early childhood education would reverse this trend and create jobs, especially for low-income women. When fully implemented, President Obama’s Preschool for All proposal would serve approximately 2 million children, creating an estimated 200,000 new jobs. The administration also proposed pay parity with the public school system and degree requirements for teachers, which would improve salaries and benefits for early childhood educators and professionalize the field. Sequestration is moving our country away from economic recovery. In the Head Start program alone, sequestration is costing tens of thousands of jobs and denying our youngest and most-vulnerable citizens the benefits of a high-quality early learning program. Rather than across-the-board cuts, Congress and the administration should focus on strategic investments in areas that will grow our economy and our workforce over the long term. Early childhood education offers both a short-term payoff by creating jobs and an opportunity to improve the workforce for the next generation.